Shoppers will go online in their thousands to take advantage of Black Friday sales and the collapse in the value of sterling. But some Irish retailers fear that consumers will abandon the main street as they seek digital bargains. A new survey has found that one in five will do the majority of their Christmas shopping between today and Cyber Monday. 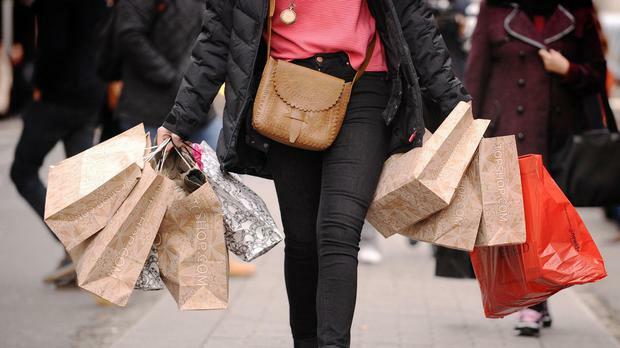 A third of shoppers intend to spend more over the coming weekend than last year, according to the survey by Amárach, commissioned by consultancy PwC. Large numbers of shoppers expect retailers to mark down prices by at least 50pc for the occasion, according to a separate survey from AddressPal.ie, the online parcel delivery service by An Post. More money is set to be spent this year as bargain-hunters react to the growing popularity of Black Friday sales. This is the informal name given to the day after Thanksgiving in the US. It will be followed by Cyber Monday, which is a European equivalent. However, consumers have been warned that some online discounts are exaggerated. The State's consumer watchdog, the Competition and Consumer Protection Commission, said it has engaged with a number of traders over false claims of Black Friday deals when in fact prices had been lower earlier in the year. Electrical goods tend to be marketed with big discounts on sites, particularly those outside the European Union. Value added tax and excise duty may be due on goods bought outside the EU. An Garda Síochána urged consumers to shop safely online and to protect their financial and personal details. Gardaí, in association with the banks' FraudSmart initiative, said there were huge risks from shopping online. Policy adviser to the Consumers' Association of Ireland Dermott Jewell said there is likely to be a huge surge in online buying in the coming days and weeks. Director of Retail Ireland Thomas Burke said online was the fastest growing retail channel. The collapse in the value of sterling and the fact that the online market in the UK is the largest in the world was driving internet sales. But he insisted its importance was being overstated, as 95pc of buying was still in shops. He said retailers were optimistic of a good Christmas despite the growing popularity of online buying.